Well, well, well. Would you look at this. There is cowardly, and then there is downright pathetic. Over the course of a magical Sunday yesterday, the European Ryder Cup team pulled off one of the greatest, most dramatic, come-back victories in team sports history. 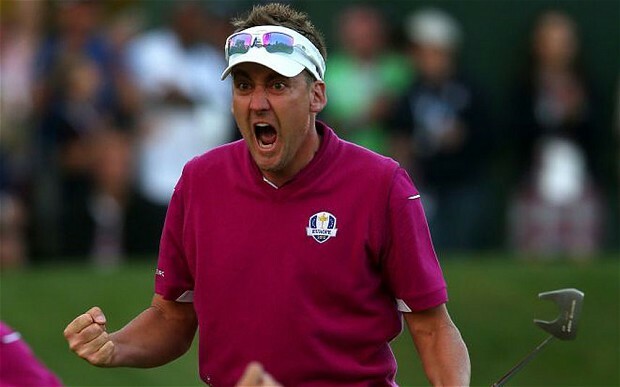 On Saturday night, despite Ian Poulter’s animated dramatics, most considered Europe completely down and out. The bookmakers had USA restrictive 1/5 favorites, with Europe available to back anywhere between 6 and 10 to 1. Come Sunday night, and Europe had hauled the USA all the way back in, to the point that Tiger Woods pathetic miss on the 18th meant Europe not only tied the US and retained the title, they won the tournament outright 14 ½ to 13 ½ . A spectacular come-back for the ages, and, you would assume, headline news, right? Visiting the US sporting media main pages today, it is very interesting to note that the US’s sports journalists appear to have run, scampered to the hills, their proverbial tails firmly between their legs. Is it embarrassment? Shame? Or just undignified, cowardly journalism? Instead of correctly acclaiming or at the very least tipping their caps to such a sensational come-back victory, the US sports media has simply avoided the topic of the Ryder Cup like the plague. It should be noted strongly most US players have been class acts since their shocking defeat. Take for example Bubba Watson. The media? Not so much. Let’s have a look around at the usual suspects. ESPN has barely a mention. A tiny single line buried on the 'headlines' feed announcing demurely 'Europe snags shocking Ryder Cup win' with as much gusto as someone selling life insurance door to door. NASCAR, college football, the NFL and baseball take all the neon lights. NASCAR, yes, that sport where everyone turns left constantly until someone is declared a winner. The New York Times allows a tiny insert photo amongst the MLB and NFL action, with a soft headline saying, ‘Europe Retains Ryder Cup’. That’s something like saying ‘The Godfather is a movie’ or ‘The Lafayette Steak in Tante Zoes in Temple Bar is OK’. You have to scroll down a couple of times on the Washington Post to find anything to do with the Ryder Cup, and when you find it, let’s just say it isn’t worth all the scrolling. It is buried deeper than a pro Obama article on FOX news. Here’s a screen shot of their front page, before scrolling down. There’s fat burning ads, RG3, MLB and regional NCAA action. The Washington Post would have you believe The Ryder Cup did not happen this weekend just passed! The Boston Globe has plenty on the Patriots, Celtics and Red Sox, and another one of those tiny little insert pen-pictures on the Ryder Cup, so popular with mainstream American Sporting media today, as it apparently hides its embarrassment from the rest of the World. 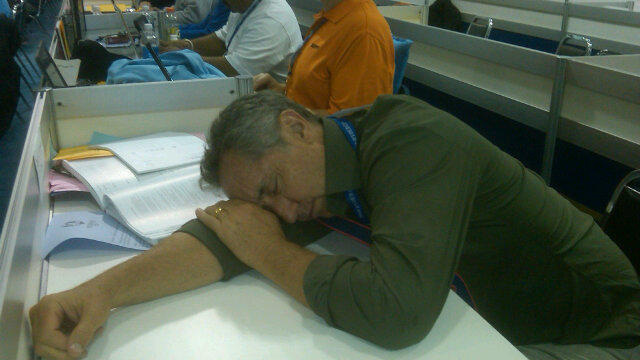 Perhaps the prevailing image that will define the US sporting media’s participation at the Ryder Cup, will be ESPN’s Rick Reilly, who reportedly earns $3 million a year, sleeping soundly in the press box during the tournament. US sporting media, wake up, stand up and be counted, show some dignity. The Ryder Cup come-back yesterday was a sensational sporting story, nay, a fantastical human story. Get your collective heads out of your hands, pull your heads out of the sand, and stop snoring on the job. Show some respect and give the Ryder Cup and the famous European victory it’s dues. Or else we’ll send this guy round.